For use on moist red rashes. 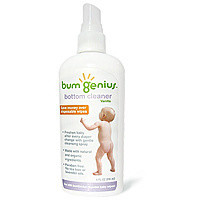 A blend of ingredients that form a barrier between baby's bottom and irritants. This is amazing for keeping away diaper rash! Finally and All-Natural Diaper Area Cleanser that is very soothing on baby's bottom! such strong chemicals that even my fingers crack! Ouch! This is safe and gentle on baby's delicate skin. Simply moisten your (cloth!) wipes or cotton pad and gently clean baby's skin! Also great for use on Boo-Boos! Freshen Baby After Every Diaper Change Fresh and natural spray gently cleans baby’s bum with the first wipe. Our formula is natural, paraben free and contains no tea tree or lavender oil. The light vanilla scent cuts down on odors. and provides significant savings over disposable wipes. for a natural, cost-saving alternative to disposable wipes. Simply Spray on baby’s bottom. Wipe clean with bumGenius Reusable Baby Wipes or a dry, soft cloth. but is actually great for oodles of uses! Non-Talc. Made with Cornstarch, Moisture absorbing Bentonite and Kaolin Clay. For use on the diaper area and the chubby folds of skin! or for men as an aftershave (essential oils are anti-bacterial). Use for cradle cap, dry skin or chapped lips! for those long nights in a wet diaper! Calming, Super-Sensitive (no scent) or Citronella Blend! for sensitive skin of all ages. A personal favorite of ours!